As far as Bohol is concerned, with its many beautiful attractions and the very laid back atmosphere, I think you already have no. 1. As to no. 2, one of the things you should know is... where will you stay. Asa man? To help you, I have added a post on what I think is the most extensive listing of hotels, inns, pension houses and resorts in Bohol with their own official websites. The list should assist you in deciding where to stay there. I myself was amazed at the sheer number of options available. Bohol indeed has become a major tourist destination in the country. From the more popular hotels and resorts in Tagbilaran City, to the more affordable inns an persion houses, to the beach and nature resorts in Dauis, Panglao, and other municipalities (i.e. Anda, Bohol), to the more specialized diving clubs (Panglao, Cabilao, etc. ), a bee farm and flower gardens, I think there is something there for all types of visitors, tourists, and travellers. 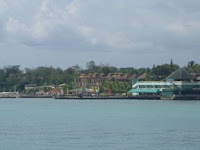 Photo of Bohol Tropics, one of, if not the most popular, places to stay in Bohol taken from the Port of Tagbilaran. I 'll take note of this. I wanna go and see the place. Please go and check out my blogsite. Let us work together promoting our own province sano! thanks sano. yes, it would be nice if bohol bloggers can work together to promote our province. Na add na ka naku! Thank you very much for this info. will keep note on my next trips to your great exciting place. cheers and more power!